This has to be the tweet of the day.
.@shannonrwatts @Everytown @momsdemand The Al Sharptons of #Gunsense nonsense. Hurry! There's only three pieces of pie left! I want to wish everyone a Happy Thanksgiving. If you are driving today or this weekend, be safe. And if you need suggestions on how to get through all the family occasions especially if surrounded by those who take Shannon Watts seriously, I might suggest going to this blog. Blake has suggestions on the five (or more) bourbons you'll need for Thanksgiving Day. Finally, if you are in the market for anything firearm related, check out my Doing My Part To Stimulate The (Gun) Economy - 2014 Edition. Herewith my annual listing of Black Friday or pre-Black Friday deals that are gun, knife, outdoor, tactical, or prep related. In the past I've posted this list later in the week but it seems that a number of retailers aren't waiting to Friday or even Thursday. I will be doing updates through the week as more of the deals are released. Think of this as a first draft. I have a lot more to add but wanted to get this part out. I like the idea of supporting friends and buying local. Tim told me the prices go live on Thanksgiving and he has some great prices. The reporters camped out in Ferguson ought to give it a look as he even will have some gas masks. Begins Monday, Nov. 24th at Midnight CST and last for eight days. $20 off a $100 purchase with code 14BLKFRI. The sale starts at 12:01 AM on Black Friday, November 28. Customers can also enter the code "J2Y" at checkout to receive an additional 10% discount on all orders for any products totaling $150 or more. It runs through midnight on Monday, Dec. 1st. Sale is effective 12:01AM EST November 28, 2014 to 11:59PM EST November 30, 2014. Most items are limited quantity. They will be selling a number of Stag Arms uppers including the 1H, 1HL, 3H, and 3HL. The doorbuster price on the 3H is $345. All in-stock firearms are 20% off Friday through Sunday. The in-store event starts at Bass Pro on Friday at 5am. Their 6-hour sale includes a brick of Winchester .22 LR for $25. Ruger 10/22 carbines will be $229 for the five-day sale. Black Friday starts at 5am on Nov. 28th. Doorbusters include a Sig Sauer 1911 with Crimson Trace grips for $899, a Ruger American Rimfire for $259, and a Rock Island 1911 9mm/.22 TCM combon for $499. Just in time for the winter weather are Danner insulated Pronghorn boots for $89. Their pre-Black Friday deals are here and change daily. You can see their entire Black Friday flyer here. Given their wimpy response post-Newtown, I would not shop there if they were given away bricks of .22 LR and Colt ARs for free. You are on your own for them. 10% off and free shipping. Use promo code "SAVE". Starts on 11/24 and ends on 12/1. Starting November 26th, and running through Sunday, November 30th, Tactical Distributors is offering 20% off site wide in honor of Black Friday. Additionally, all orders over $79 qualify for free shipping. Use promo code FREAKOUT20 to apply the discount. OP Tactical will be running a Black Friday Sale from Nov. 24th through Nov. 28th. Use promo code "BF2014". Receive 25% off ALL products from SORD. Use promo code "BLACKFRIDAY14". 10% off and free shipping. Use promo code "SAVEBIG". Starts on 11/23 and ends on 11/30. Some doorbusters depending upon purchase. On Friday only, they will be selling the Cannon wide body safe for $699. Also of interest to hunters would be their Masterbuilt Electric Digital Smoker. They open at 6am. The TNVC Christmas Sale is going on now through the end of the year. Use promo code "XMAS14" at checkout for substantial discounts on their TNV/PVS-14, IR Hunter Thermal Scope, and TNV Sentinel Night Vision Goggle. Gander Mountain will be open from 8am until Midnight on Thanksgiving and then re-opens at 8am on Friday. Among the Thanksgiving Day specials are the S&W M&P Shield for $399 and the Liberty Fatboy 64 safe for $1,999. Academy Sports opens at 5am on Friday and their on-line store opens at 10pm CST on Wednesday. Doorbusters include a Windham Weaponry AR for $579.99, a Taurus PT111 Milennium for $259, and 325 round packs of Federal Match .22LR for $17.99. Their Black Friday sale starts at 6am. Included in their doorbusters is a Bushmaster Carbon 15 for $499. The Ruger American Rimfire goes for $199, the SIG P238 is $489, and the Para 1911 Expert is $299 after a $100 rebate. All 5.11 gear is 25% off. Their Black Friday sale starts at 6pm on Thanksgiving and goes to 3pm on Friday. Among the early bird items listed are a Bushmaster Optics Ready Carbine for $549 (after rebate) and a Canon 48 gun safe for $649. That same carbine was $799 last year. Now through Christmas, they are holding their PolymAR sale. This is to celebrate the finishing of their polymer production facility. They are offering 25% off all individual polymer items and 35% off combo items. Their stores open at 5am on Black Friday. Among their Friday specials are a M&P-15 Sport for $619, a Mossberg 500 Field/Slug Combo for $289, and a Glock 19 for $499. Free shipping on all orders over $200 when placed on Nov 27th and 28th. 50% off on all LaRue Polymer including grips, stocks, etc. Black Friday offer is free shipping on all items with no minimum from Nov. 25th to Dec. 2nd. Save on the LBT 6094 Modular & Low VIS Slick Carriers. Sale starts November 27th at Noon, and runs to December 2nd at Noon. Normally $400 or more, they will be $300 for this sale. 30% off on all items in their store including magazines. Now through 12/12/14. 20% off everything in their on-line store. No code needed. Nov. 28-30. 20% off all items now through midnight, Dec. 1st. Use code "THANKS-2020". Free shipping on all orders now through Cyber Monday, Dec. 1st. No code needed. Free patch for orders over $100. All of their AK and AR grips are 30% off through midnight, Sunday, Nov. 30th. Use code "Friday". All regularly priced items are now 25% off now through Dec. 1st. Use code "XXVBFR". 30% off all items and 40% off of turkey calls through Nov. 29th. No code needed. Big savings from November 24th through December 8th on metal and polymer items. Click on their Deal of the Day tab. Their handguards look kinda interesting to me. Their Black Friday sale includes demo/scratched uppers for $65, basic M4 buttstocks for $12.48, DPMS lower parts kits for $49.95, and a whole lot more. Instead of Black Friday they will be having Stag Friday. They will be offering three of their knives with stag handles at very nice prices. The sale goes from 9am to 3pm EST on Friday. These knives will also be offered by their authorized dealers. Go to the website for a list. Free ground shipping on orders above $30 until 12/1/14 plus 15% off all Condor, Alpha, and Eberlestock items. If you live in the Barre, Vermont area, everything is 30% off on Friday for walk-in customers. Up to 50% off all books, DVDs, etc. through Dec. 3rd. Downloads are $1.99 through 11/30. They are taking pre-orders through Cyber Monday for the Vickers "Adapt or Die" T-shirt. The price is $13.95. Also get 15% off a Vickers Sling by signing up for their email list. Opens at 8am on Friday and 8am on Saturday. Deals include a CZ-USA P-07 for $349 (with threaded barrel), an Adams Arms piston AR-15 for $699, and a Mossberg Tactical 22 with a free brick of .22LR ammo for $219.00. More of their Cyber Week specials can be found here including Canik 9mm pistols for $99. 15% off for all new customers with code HPBF2014, 25% to email subscribers (coupon in the mail), and more starting 12:01am Nov. 28th. Cyber Monday special is 20% off any in-stock firearm. Must call 1-800-336-0184 to order. Starts at noon on Thanksgiving. Free shipping for the first 48 hours with code BFSHIP. Other discounts using code BFSAVE until Dec. 5th. 10% off all rifles plus 3 free PMags. Complete railed uppers in either .223 or .300 Blackout only $399 plus $5 UPS shipping. These are assembled by Seekins Precision. Prices good through Dec. 1. You can see details in this video. All DVDs and yearly subscriptions are 25% off through Dec. 2nd. I have a number of their DVDs and they are highly recommended. Black Friday deals now through midnight CST 12/1/14. Use code "BLACKFRIDAY". They call this Black Raven Friday. Deals include $200 off any 5-day class registered for on the 28th. Registration and deposit must be sent to Karen@gunsite.com. Their proshop sale will run Nov. 28-30. Sale runs Black Friday through Christmas. Includes everything from 1911 magazines to .300 AAC Blackout match grade barrels. Black Friday sales include package deals with soft case, your choice of ARMS or Daniel Defense rails, MOE stock and pistol grip, and a Barrett cap. All products are 15% off from Nov. 26th through Dec. 1st. Use code thanks2014. Beginning at 12:01 am on Thanksgiving morning, until 11:59 pm Cyber Monday night, IDF Holsters is having a Black Friday Sale, with special 30% off discounts on every item in stock. Use promo code TAKE30. They are calling these deals Black Friday-ish. These deals from now through Nov. 30th or while supplies last. Soldier Systems also has an extensive listing of tactically oriented Black Friday specials. They are too numerous to copy. You can access them here. Also check the listings from SlickGuns.com. Smith and Wesson Holdings Corporation (SWHC), the parent company of Smith & Wesson, got started early on their Black Friday shopping. They are reported to have purchased Battenfield Technologies for approximately $130 million. Battenfield Technologies is a Columbia, Missouri-based maker of firearms accessories. Smith & Wesson expects the deal, set to close in mid-to-late December, to boost the company’s margins, earnings and cash generation in its business year ending in April 2016. The move is also expected to contribute incremental revenue of more than $55 million for the 2016 business year. Battenfeld Chief Executive Jim Gianladis will serve as the president of Battenfeld Technologies and will report directly to Mr. Debney. Battenfeld was acquired by private-equity firm Clearview Capital in June 2012. Battenfield's brands include Caldwell, Wheeler Engineering, Tipton Cleaning Supplies, Frankford Arsenal, Bog-Pod, Lockdown, Golden Rod Moisture Control, and Non-Typical Wildlife Solutions. Battenfield was owned until 2012 by Larry Porterfield of MidwayUSA and his family. They sold their interest in the company to Clearview Capital and to members of the Battenfield management team. Shannon Watts and her crowd at Everytown Moms for Illegal Mayors are fanatics and not in a good way. They want to take a joyous family gathering and impose their specious ideology on the occasion. They readily confuse fact with myth and myth with fact. 1. Ask your relatives if anybody has recently purchased any cool new firearms and if they brought them to share. 2. Suggest that your relatives who are afraid of firearms that they might want to consider some basic firearms training in order to overcome their irrational fears of inanimate objects. 3. Double check that your firearms-owning relatives are observing proper gun safety and seem to be taking it as seriously as they should. Maybe pass around one of your own unloaded firearms and observe how your folks treat it: muzzle discipline, chamber checking, etc. 4. Remind your relatives to read John Lott so that they are much less likely to fall for the myths about firearms that the "Control Freaks" continue to spread in the attempt to give their bogus little emotional narratives validity. 5. Be certain to share with relatives all the fun and enjoyment you've had with firearms since you saw them last. 6. Maybe ask the youngsters about how much anti-gun drivel they are hearing from the clueless adults in their schools. Maybe give them some advice about how to handle it without jeopardizing their grades or being kicked out of school. 7. Lastly, just smile really big when the talk turns to the wonderful hobby of firearms! You can also share with them my Black Friday compilation of gun, tactical, and hunting sales. This tweet by Jonah Goldberg of National Review characterizes my feelings about what the whole Ferguson situation has become. The only reason I've even given Ferguson a passing thought is that my step-daughter and her husband, my mother-in-law, and my sister-in-law and her family all live and work in St. Louis. All right, I'm going to bed. I've had enough of cable TV enjoying itself while acting like it hates covering riots. Smith & Wesson and General Dynamics announced today that they would be partnering on a submission for the Army's Modular Handgun System. This is the Army's plan to upgrade their sidearm's from the Beretta M9 which is getting a little long in the tooth. When you think about it, this partnership makes a lot of sense. Smith & Wesson knows handguns and has done very well with their polymer striker-fired M&P platform. General Dynamics knows defense contracting and they are one of the largest defense contractors making everything from nuclear submarines to Gatling guns. It will be interesting to see what they come up with. Other handgun manufacturers would be smart to follow their lead in approaching this as a joint project. ST. PETERSBURG, Fla. – General Dynamics Ordnance and Tactical Systems and Smith &Wesson Holding Corp. are partnering to pursue the U.S. Army's Modular Handgun System (MHS) solicitation to replace the M9 standard Army sidearm. The strategic partnership's Modular Handgun System will be based on the Smith &Wesson M&P Polymer Pistol platform. Designed with a reinforced polymer chassis, superior ergonomics, ambidextrous controls, and proven safety features, the M&P is used by U.S. and law enforcement agencies worldwide. The M&P's features make it well suited for the MHS requirement by providing sidearms that exceed the military's expectations for a future modular handgun in terms of performance, reliability and durability. The M&P pistol has been in production since 2005. "This partnership combines General Dynamics' proven legacy in manufacturing military armaments with Smith &Wesson's extensive experience in designing and manufacturing firearms for commercial applications," said Tim McAuliffe, vice president and general manager of medium caliber ammunition and weapons for General Dynamics Ordnance and Tactical Systems. "General Dynamics' extensive background in winning and managing military contracts brings proven leadership to the venture and by joining together, we will use our combined knowledge and expertise to bring this unique capability to the U.S. military to better equip the warfighter." Smith &Wesson President and CEO, James Debney, said, "The strategic partnership between our two companies provides us with a tremendous opportunity to support our military with a state-of-the-art sidearm, namely our M&P pistol. General Dynamics Ordnance and Tactical Systems brings us a wealth of experience and resource in federal government contracting and that capability is an ideal match with our knowledge in handgun manufacturing technology. We look forward to working together to pursue this exciting opportunity to support our military." The Army's draft MHS solicitation identifies design and performance requirements for a new modular handgun system that can be easily adjusted to fit all hand sizes and is optimized for improved gun, ammunition and magazine performance. The Army's stated plan is to commence the competition in January 2015, with delivery of the first new handgun systems in 2017. The Republican majority in the North Carolina House of Representatives elected Rep. Tim Moore (R-Cleveland) to replace Senator-elect Thom Tillis as Speaker. Moore, a Kings Mountain attorney, was selected on the first ballot by House Republicans as they met in Asheboro. Moore won a majority of votes from the 73 GOP lawmakers that met at Randolph Community College. He beat Reps. Justin Burr of Albemarle, Mitchell Setzer of Catawba, John Blust of Greensboro, Leo Daughtry of Smithfield and Bryan Holloway of King. Rep. Paul “Skip” Stam of Wake County was nominated as speaker pro tem. Rep. Mike Hager of Rutherford County was elected majority leader and John Bell from Wayne County, majority whip. Huntersville Republican Charles Jeter was unopposed for conference chair, a post in which he’ll oversee campaigns and fundraising. Moore was ranked second in the NC House in terms of effectiveness by the North Carolina Center for Public Policy Research. He had chaired the House Rules Committee. So what does this mean for gun rights in North Carolina? Moore was recommended by Grass Roots North Carolina-PVF where he was ranked 4 stars. He was endorsed by the NRA Political Victory Fund and rated as A+. That's a good start. It does get better as Rep. Moore was one of the speakers at a gun rights rally in 2013 organized by GRNC. Given their reputation as a "no compromise" organization, the fact that Moore would be one of the speakers says volumes about him. It was through the efforts of Moore as head of the Rules Committee that Durham County's 80 year old gun registry was scrapped. What about the rest of the Republicans in the House leadership? Rep. Skip Stam (R-Wake) who will be Speaker Pro Tem is, at best, mediocre. He was rated B- by the NRA-PVF and did not receive an endorsement. Stam was not recommended by GRNC-PVF and was rated a mere 2 stars. He was characterized as a "weasel" by GRNC for his efforts to weaken some of the gun rights laws that passed the General Assembly in the last two sessions. Rep. Mike Hager (R-Rutherford) who will be the House Majority Leader is much better. He received both a recommendation and 4 stars from the GRNC-PVF while also getting an A and the endorsement from the NRA-PVF. Hager was one of the sponsors of the bill that made the names of NC CHP and pistol permit applicants private. Rep. John Bell (R-Wayne) is slated to be the House Majority Whip. He was rated as 4 stars by GRNC-PVF and was recommended. The NRA-PVF graded him an "A" and gave him their endorsement. 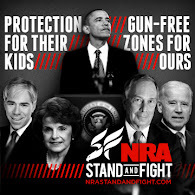 His website points out the fallacy of gun-free zones and says they put innocent lives at risk. He sponsored HB937 which increased the number of places firearms would be permitted. Rep. Charles Jeter (R-Mecklenburg) is the Republican Conference Chair. He was rated 3 stars by GRNC-PVF but was recommended. The NRA-PVF graded him an "A" and gave him their endorsement. His position on the Second Amendment post-Newtown was not to be reactionary like legislators on New York and Connecticut. One thing I think should be pointed about this House leadership is their relative youth. Speaker-elect Tim Moore is 44, Conference Chair Charles Jeter is 41, and while I don't have the exact age for Majority Whip John Bell, he appears to be in his late 30s to early 40s. House Majority Leader Mike Hager is a little older at age 52. Speaker Pro Tem Skip Stam is the old guy of the bunch at 64 but, then again, the position traditionally is held by older legislators. To conclude, with the exception of Skip Stam, the Republican House leadership for the upcoming session is good on guns. This is good news for gun rights bills that will be presented in the new session. I saw this tweet this morning from the WaterPik Company which I've embedded below. They are giving away a 3-D printer. They ask, "What would you make with a 3-D printer?" Definitely this if it can print in metal! I don't where the heck I'd put the thing but I'll save that problem for when I win. We are clearly disappointed by Jay Leno's decision not to perform at the 2015 SHOT Show State of the Industry Dinner. He unilaterally cancelled his promised appearance due to pressure from the anti-gun lobby, which included false statements about our industry and its commitment to genuine firearms safety, which we attempted to personally correct with him, but to no avail. We are proud of the many programs that we run that meaningfully contribute to public safety including our long standing Project ChildSafe and Don't Lie for the Other Guy initiatives in addition to our members everyday work in compliance with comprehensive federal and state laws. We will not allow the lawful commerce in firearms nor our industry to be demonized and we will continue to speak out for the Second Amendment rights of the millions of law-abiding citizens who are our customers. Despite Mr. Leno's cancellation, we look forward to having our biggest and best State of the Industry Dinner to date with a performer that respects the contributions of our industry and the customers it supports. I originally was going to title this post, "The Spine of a Jellyfish". In other words, the man has no spine if he can't stand up to the shrill Mommies and the ne'er do wells at CSGV. Saying it was a mistake to have signed on to do the gig just compounds it in my eyes. While I still believe that, I also understand this is not about one aging comedian. Rather it is part of a coordinated effort to destroy the gun culture by making it an anathema. That is part of the long game behind so-called universal background checks given how it restricts transfers and not just sales. In my opinion, the best way to do it is the grow the grass-roots and with it the gun culture. We need to make personal outreach efforts to friends and family and take them shooting. We have to stop whispering about our gun ownership. We need to take a page from gay rights activists and their "We're Here - We're Queer - Get Over It" movement. I can't think of something with a nice alliteration right now but you get the idea. We have an enumerated civil right to keep and bear arms and we should never forget that. We also have an enumerated civil right to free speech, the right to peaceably assemble, and the right to petition the government to redress grievances. We need to start doing more of all of that and it needs to start today. Who would have ever believed that Putin's Russia now provides better gun rights than the District of Columbia, Maryland, New Jersey, New York, and most of California. Russia, unlike DC and aforementioned states now allows self-defense as a valid reason to be issued a carry permit. Permit holders are not allowed to carry in schools, nights clubs that serve alcohol, and mass public gatherings. Carry while under the influence of alcohol is also prohibited. Self-defense weapons allowed include handguns, shotguns, stun guns, and tear gas/OC but not swords or rifles. I wonder what America's own would-be oligarch Michael Bloomberg thinks of this. Remington Outdoor Company recently cut more jobs at its plant in Ilion, New York. Part of the reason was declining sales of Remington firearms and part was due to New York's SAFE Act passed in 2013 according to a letter from Remington CEO George Kollitides. New Yorker Against Gun Violence Executive Director Leah Gunn Barrett says that public safety trumps economics. Critics love to use the New York SAFE Act as a whipping boy, but let’s face it, that law is keeping New Yorkers safe and keeping New York communities safe and our kids safe and guns out of the wrong hands, to me that’s more important. And just how many murders, robberies, etc. were committed with an AR-15 in New York, Leah? Sometimes the tweets from Shannon Watts of Everytown Moms for Illegal Mayors cause me to just shake my head. We know she is trying to shake down the Kroger chain of stores because they won't kow-tow to her regarding lawful carry of firearms in their stores. This Kroger policy extends to their subsidiaries such as the Harris Teeter grocery chain here in North Carolina. As part of Watts' shake down efforts, she sends out tweets like the one below in the hopes that her unthinking minions will uncritically re-tweet it. Reading the linked story at NBC Charlotte, one finds that a man armed with a firearm and a crowbar robbed a Charlotte Harris Teeter in the pre-dawn hours of Monday. The armed robber forced some employees back into the store at gunpoint. He then forced one employee and a witness to smash a jewelry display and put the jewelry into a bag with the threat of shooting another employee. The robber then escaped with the jewelry. Under North Carolina criminal law, this is a violation of § 14-87 (Robbery with firearms or other dangerous weapons) which is a Class D felony. The robber's actions of forcing the people back into the store meets the state's definition of kidnapping which, since no one was reported injured, is a Class E felony. We don't know if the armed robber was a felon. If he was, he would be in violation of both Federal and NC law concerning being a felon in possession of a firearm. And this is just a start. Looking at sentencing guidelines, the robber is looking at a minimum of five years for the armed robbery and two years for the kidnapping offense if this was his first brush with the law. Armed robbery is a crime. It has nothing to do with the lawful carry of a firearm in a grocery store to protect oneself and one's family against harm. Posting this Harris Teeter grocery store against legal carry would only add one more charge to the armed robber's long list of crimes and would leave a whole lot of other people defenseless. Perhaps since the criminal used a crowbar in the commission of his crimes, we now need #Crowbar Sense. It is as logical as #gunsense. New Jersey judges have quite the sense of humor. On Monday, the judiciary system raised about 80 of their court fees. The money will be used to pay for bail reform, increase monies going to Legal Services of NJ, and an improved electronic filing system. They expect to raise $42 million in revenue from these increased fees annually. Among the increases taking effect: Filing a lawsuit, an appeal or for divorce costs $50 more. Filing a small claim costs $35, up from $15. Permits to carry a handgun cost $50, rather than $20, and it now costs $50 to appeal a denial of a permit to buy a handgun. What permits to carry a handgun? New Jersey does not issue permits to carry a handgun to law-abiding civilians. Unless you walk into the court with some thug holding a gun directly to your temple, you will be denied, and then denied upon appeal. The entire system is rigged to keep free people from exercising their natural human right to defend innocent life. The gun prohibitionists argue banning guns in certain locations make them safer. They especially push this argument with regard to schools and universities. The argument against allowing firearms on university campuses is that college students are impulsive irresponsible drunks who would go around shooting up the place. At least that is the impression left by the Brady Center from their amicus brief in the case of D'Cruz* v BATFE (later renamed Jennings v BATFE). So it was with interest that I read this notice sent out by the Western Carolina University Police Department last Wednesday. Didn't these miscreants know that the University of North Carolina and all its constituent institutions like WCU are supposed to be gun free? I'm sure the baseball bat was only for use in intramural games. The only firearms allowed on campus are those of concealed carry permit holders which must be kept locked in their cars. And even that modest measure upsets the university's administration. So I would say to the university chancellors and police chiefs who were united in their opposition to any guns on campus, tell me again how gun-free zones are safe and crime-free. * James D'Cruz, the original plaintiff, was demonized and vilified by the Brady Campaign. Josh Horwitz of CSGV even wrote he "sounds like a school shooter." I wonder what they would make of the fact that James is now a first year law student at Harvard Law School. My first post on this topic looked at the long game being played by Michael Bloomberg and his minions at Everytown Moms for Illegal Mayors. Some have postulated, and I would tend to agree, that the ultimate goal of these initiatives is to discourage new entrants to the gun culture rather than merely imposing a universal background check system state-by-state. Since last Tuesday when Initiative 594 won in Washington State, I've been thinking about the factors that led to Washington State being chosen as the test bed and what they may tell us about who gets chosen as the next target (after Nevada). The first, and most obvious factor, is that the state must have some form of initiative process. The initiative process and the referendum were children of the Progressive Movement of the late 19th and early 20th centuries. The movement, unlike today's progressives, was not synonymous with liberalism. If anything, it was a reaction to the masses of immigrants to the United States and the impact that they had on politics in cities and states. The Progressive Movement was anti-political machine and what better way to take power out of the hands of Tammany Hall and other political machines that catered to new immigrants as well as from the "robber barrons" than through the promotion of direct democracy. The key components were the initiative, the referendum, and the recall. The states that adopted the direct and indirect initiative are primarily west of the Mississippi. Of the 21 states that offer some form of initiative, only four are east of the Mississippi. These are Maine, Massachusetts, Michigan, and Ohio. A little explanation of the difference between the two types of initiatives. The direct initiative such as was seen in Washington State means the proposals that qualify go directly to the voters. By contrast, an indirect initiative is a petition to a state legislature to pass a certain bill and then, if they fail to do so, it goes to the voters to decide. This is the process used in Nevada. The next factor that I thought would have an impact was the proportion of the state's residents that were actually born there. I call this the "Californication" factor. In other words, people move from California to other states such as Nevada, Oregon, and Washington and bring their California attitudes with them. We see a similar pattern in the East as in-migrants from states like New York, New Jersey, and Massachusetts have altered the politics of states like Florida and Maine. I think state natives are less likely to be swayed by Bloomberg's efforts. Another factor that I thought should be considered is the degree of urbanization of the state. Urban dwellers are less connected to the land, less likely to have come from a hunting family, and more likely to see firearms as a crime problem. By contrast, the higher the percentage of gun ownership, the more likely people are going to be to stand up for their gun rights. Below is an Excel spreadsheet that I composed using these factors along with which party holds the governorship, did the state vote for Obama, and has Everytown/MAIG registered a 503(c)(4) or (c)(3) in that state. I have ordered the states by their average rank based upon the variables seen. The lower the average rank, the more likely the state is to be a target for Bloomberg and his henchmen (or henchmoms, as the case may be). Let me explain how I derived the ranks for each variable. Initiative Type - I considered the direct initiative to have less political impediments for Everytown so it was coded a "1" while the indirect initiative is a "2". Percentage of Urbanization - This data was taken from the Iowa Community Indicators Program which looked at the urbanization of the population of a state. This is 2010 data. I rank ordered the state from most urbanized to least urbanized. Percentage of State Native Born - This looks at the percentage of the state's residents that were born in that state. The rank goes from the lowest percentage of state native born to the highest percentage of people born in the state in which they are residing. Percentage of Gun Ownership - This data was taken from estimates of gun ownership by state as of 2007. I rank ordered the states from least percentage of gun ownership to most percentage of gun ownership. Governorship - I originally coded states with Democrat governors as a "1" with states having a Republican governor as a "3". Upon reflection, I reversed it because a state with a Republican governor should create more impediments to gun control and thus would encourage the gun prohibitionists to seek ways around the governor. 2012 Presidential Election - This looked at who won the state: Obama or Romney. I considered states that chose Obama would be more likely to look favorably on gun control and thus were coded a "1". An alternative view is that these states have more low-information voters. Everytown 503(c)(4) - Has Everytown or MAIG registered a political action non-profit in that state? If so, it means they have prepared the ground in advance of seeking an initiative. The impetus to look for this variable came from a column by David Codrea describing the move to the states by Bloomberg. This data is up-to-date as of yesterday. More states have been added since David's first alert on their moves. Examining these rankings, it then comes as no surprise that Nevada was the next target for a universal background check initiative. They had the lowest average of any state. The degree of urbanization - 94.2% - and the small number of state native born - 24.3% - made Nevada an ideal candidate. The fact that many of the state's in-migrants come from California adds to the problem. Likewise, Arizona, despite the lowest Brady Campaign score of any state (50), is also a prime candidate for a push for universal background checks. They have a highly urbanized population - 89.8% - and the second lowest number of state native born - 37.7% - of the states with an initiative. The saving grace for Arizona is that they have a robust gun culture even though their actual percentage of gun ownership is rather low. Rounding out the top five, California and Colorado already have universal background checks and Massachusetts requires a permit to own a firearm. Washington State came in at number six on this list. So why was Washington State chosen for the first test case instead of Nevada or Arizona? If I had to guess, money had a lot to do with it as well as a compliant media. Bill Gates had previously shown a willingness to donate to an earlier Washington State gun control initiative and Nick Hanauer was fully on board. Combine that with only two major media markets in which all three major papers endorsed the initiative and you can see why Washington State was a prime candidate. The top billionaires in Nevada tend to be either outright conservatives like Sheldon Adelson or tied to the gaming industry where they might not want to rock the boat. Finally, there is Oregon which is sandwiched in between California and Washington. It has endured a considerable amount of in-migration from California. I don't know enough about the gun culture and its strength in that state. The state has been trending much more liberal in the last couple of decades which could be problematic. I'd still put the state on a watch list. I am open to suggestion on how to improve these rankings. If you can think of factors that I haven't considered and for which I can get reliable data, please let me know. I'd be happy to add them to this data analysis. We underestimate our enemies at our peril. The Washington State universal background check initiative, I-594, should have taught us that. We may think that Michael Bloomberg is a rich, power-mad little Napolean or, as Michael Bane calls him, a nastly little Fascist. However, he did not get to be rich by marrying the right woman or picking the right parents. No, he saw a need and devised a way to fulfill it. Along the way, this insight and his skills made him a very rich man. The bottom line is he is not stupid and he can think strategically. Likewise, it is easy to dismiss Shannon Watts as an up-marrying, social climbing PR flack who attached herself to gun control as a way to rejuvenate her ailing career. However, she didn't get to be a VP at Wellpoint without some degree of talent and a mastery of public relations tactics. We have seen that with the way she created the appearance of a win for gun control - even it if wasn't - from the announcements by companies like Starbucks and Chipotles that they didn't want guns in their stores. Perception is reality and the perception is that guns were banned there even if it was merely an unenforceable polite request to leave the guns at home. Thus, when I read this post from Hyperion 1144 on Reddit, a light went off. The goal of Bloomberg wasn't universal background checks. It was to kill the gun culture in America by strangling its ability to bring new adults into it. We always say that taking someone shooting is a great way to inoculate them from the claims of the gun prohibitionists. If that is made too hard by the restrictions on transfers in I-594, then we can't achieve this inoculation. I-594 is a not a tactical move by gun confiscationists, it is a strategic move. This law was created by smart, wealthy, well-funded persons who are playing the long game, and if gun owners don’t start running a long-game strategy to match, we are done for within two generations. Washington has passed Initiative 594, a law marketed as requiring background checks on all sales, but which in reality has criminalized the act of touching any gun you do not own. This means that if you don’t own a gun in Washington State, it is now illegal for you to touch a gun. I haven’t yet seen an article, comment, or post anywhere that takes into account the long-term cultural implications of such a regulation. I-594 is literally a legislative vaccine against the spread of gun culture. How is someone curious about guns in Washington state supposed to learn about them about now? They won’t be able to go shooting with friends, they won’t be able to go to friends house to be shown how to field strip a 9mm. Gun classes have likely been outlawed. Gun rentals are likely gone now, too. 1) The children of gun owning families. 2) The rare, entirely self-motivated individual who is willing to trek into an unknown world completely alone. Played over years and decades, this is how you slowly disarm a population without getting substantial complaints from that population. The only way we maintain our 2nd Amendment rights is to fight for them. The only people who will fight for them are people who understand firearms, and the reasons for owning them, well enough to be willing to fight. The only way most people come to an understanding of this is if someone else taught them or helped them to understand. Now, virtually all non-familial acts of teaching and culture-sharing are illegal. In the long-term cultural sense, I-594 is the single most dangerous piece of gun control legislation ever conceived. It makes the NFA and the Clinton Assault Weapon Ban look childishly simplistic by comparison. This time, they didn’t ban certain mechanical or cosmetic features. They didn’t ban full-auto or select fire or short-barrel rifles. This time, they banned a culture, our culture. If this stands or spreads, we are done for. I think the author, Hyperion 1144, makes a lot of sense and we need to get that message across to all gun owners - Fudds, Threepers, Prags, or what other subgroup of gun owners you can think of. As to the last sentence in the Reddit post, it has spread to the state of Nevada. This was not unexpected as a universal background check bill passed the Nevada legislature last year but was vetoed by Gov. Brian Sandoval (R-NV). Everytown President John Feinblatt said as much after I-594 passed calling it just the beginning. The group fought off an attempt by the Nevada Firearms Coalition to keep it off the 2016 ballot. The only change made to the wording of the ballot initiative was make sure voters knew the penalties for violations would be a gross misdemeanor for first offenses and a felony conviction for the second offense. This is identical to Washington State's I-594. Sebastian has some ideas on how to fight off Bloomberg on the ballot initiatives. I haven't digested all of it yet but it sure has set off a storm of comments. David Codrea notes that the effort in Nevada was something he warned about last year. Back then, David did some investigative digging into the Nevada effort and found the fingerprints of Bloomberg all over it. Unfortunately, not enough people listened at the time. Part 2 of this post will be an effort to identify future targets of Bloomberg's opportunism. "The Second Amendment Was For When The British Were Coming"
If I were a book publisher, I'd be offering Emily Miller a book contract right now. That's because you know she has another one in the offing with the way she is being treated by the DC Police as she tries to get a DC carry permit. The headline comes from what a DC police employee said to Ms. Miller regarding the Second Amendment. He said it really doesn't apply to the District because it "was for when the British were coming." You can't make this stuff up. Katie Pavlich gives her take on Ms. Miller's travails here. Four gun shops in California are suing California Attorney General Kamala Harris over a state law that prevents them from advertising handguns for sale. Penal Code Section 26820 which dates back to 1923 prohibits dealers from saying they have handguns for sale on their buildings. This includes even having a picture or drawing of a handgun posted where it can be seen from the street. The suit, Tracy Rifle and Pistol et al v. Kamala Harris et al, alleges that the California law is a violation of the First Amendment rights of the gun shops and their owners. The complaint notes that handguns are lawful items and that the "First Amendment protects the dissemination of truthful, nonmisleading commercial information about lawful products". The attorneys for the plaintiffs are Stephen Duvernay of the Benbrook Law Group and Prof. Eugene Volokh of the UCLA School of Law. Prof. Volokh also runs the well-known legal blog The Volokh Conspiracy. The lawsuit is being supported by the California Association of FFLs, the CalGuns Foundation, and the Second Amendment Foundation. November 10, 2014 (SACRAMENTO, CA) -- Four California gun dealers are filing a federal lawsuit today against California Attorney General Kamala Harris over what they say is a violation of their First Amendment civil rights. Stephen Lindley, who heads the DOJ’s Bureau of Firearms, is named as a co-defendant in the case. Tracy Rifle and Pistol, a firearm retailer and indoor shooting range located in San Joaquin County, was recently cited by Harris’ Department of Justice for having pictures of three handguns in window signs that can be seen outside the store. California Penal Code section 26820, first enacted in 1923, bans gun stores from putting up signs advertising the sale of handguns -- but not shotguns or rifles. An adjacent window image at Tracy Rifle, which shows a photograph of an AR-15 rifle, was not cited by the DOJ. Though the case doesn’t claim a Second Amendment violation, plaintiffs do argue that commercial advertisement of constitutionally protected products and services -- whether abortion, contraceptives, or guns -- is especially clearly protected under the First Amendment. The plaintiffs are also represented by Benbrook's colleague Stephen Duvernay and Eugene Volokh, a UCLA law professor who has written and taught extensively about the First and Second Amendments. Before joining the UCLA faculty 20 years ago, Volokh clerked for Judge Alex Kozinski of the Ninth Circuit Court of Appeals and Justice Sandra Day O'Connor of the U.S. Supreme Court. He also operates the popular legal blog “The Volokh Conspiracy,” now hosted at the Washington Post. Today is Veterans Day. Up until 1954, it was known simply as Armistice Day. The change came about due to the efforts of WWII veteran Raymond Weeks who had the idea to celebrate all veterans and not just the veterans of WWI. Thus, I would like to give my thanks to all veterans, living and dead, for their service to our country. Armistice Day which commemorates the end of WWI got me to thinking about my grandfathers. While neither served in WWI, I was able to find their draft cards. My paternal grandfather, William Thomas Richardson, was a farmer and had four children when he registered for the draft in 1918. My father did not come along until 1919. My maternal grandfather, John Francis Sheridan, was a tax assessor with the City of New York. He registered for the draft in 1917. He did not marry my grandmother until 1918 and my mother was born in 1919. My mother told me that he was always disappointed that he was turned down for service due to his eyesight. 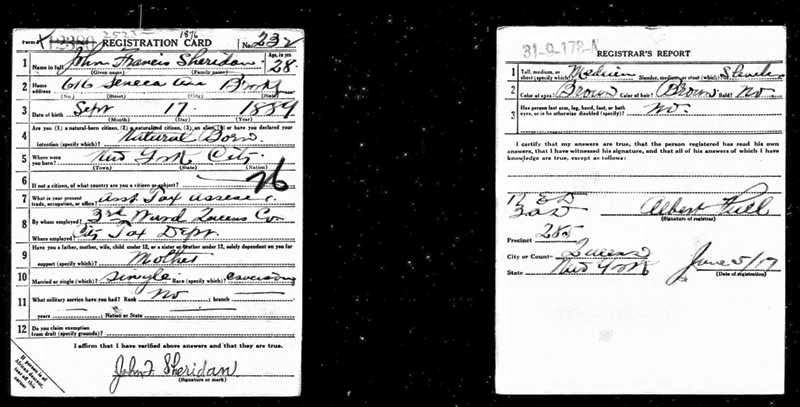 If you look at the lower left corner of my Grandfather Sheridan's draft registration, you will see a tab that reads, "If person is of African descent, tear off this corner." I find it interesting that this is on the card belonging to my grandfather residing in New York and not the one residing in North Carolina. I found these on Ancestry.com. Today it is free to search their military records collection. 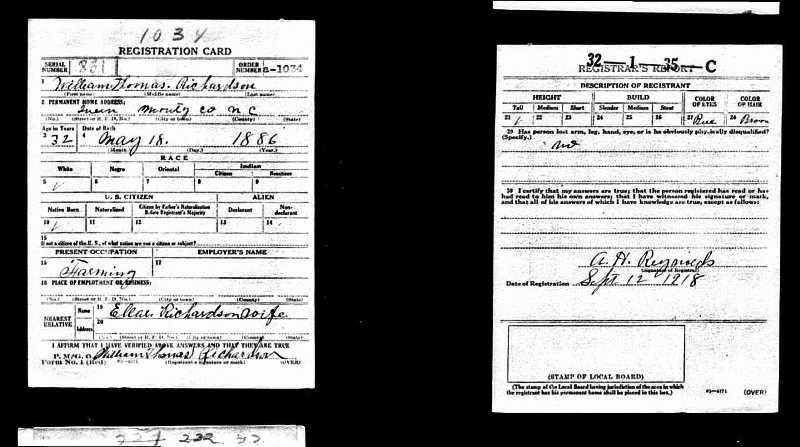 They have draft cards from WWI and WWII as well as US Navy ship muster rolls. If you want to do more in-depth searching on an ancestor's US military background, you can get records from the National Personnel Records Center, Military Personnel Records. Gabby Giffords and her husband Mark Kelly have a lot invested in keeping her old Arizona seat Democratic. It is currently held by Rep. Ron Barber (D-AZ) who was Giffords' congressional district director. He was wounded in the same attack that injured Giffords. Giffords and her gun control organization Americans for Responsible Solutions have poured approximately $2 million into the district for ads attacking Col. Martha McSally USAF (Ret). McSally lost to Barber for the same seat in 2012. According to the latest Federal Elections Commission reports, they put in over $500,000 in the first half of October alone. Americans for Responsible Solutions had been running the ad below which was inaccurate. They removed it 24 hours before it was supposed to go off the air. Politico ran a full story on Giffords' and ARS' misleading attacks on McSally. They claimed it was because McSally reversed her position on stalkers and guns. Thus, it has to be a big slap in the face to Gabby, Mark, and Americans for Responsible Solutions to see McSally leading Barber by 36 votes with the ballots from Cochise County yet to be counted. Technical problems with voting machines in Cochise County have delayed results in the region’s most-watched race, but it could bode well for GOP challenger Martha McSally. She and Democrat Ron Barber, the incumbent, were separated by only 36 votes, according to the latest totals this morning. However, Cochise County tallies are missing and McSally was expected to have another strong showing in the county she won in 2012 by 59 percent to 41 percent. McSally currently has 78,785 votes to Barber's 78,749 with 49 precincts uncounted. If things go the way that they should, McSally will win this race. Assuming that happens, it will be amusing to see how Giffords and Kelly and their henchmen at Americans for Responsible Solutions spin the result. There is just no way to do it without looking foolish. UPDATE: According to the official Arizona Secretary of State election returns, Martha McSally is leading Rep. Ron Barber by 2,078 votes with all precincts reporting. The final unofficial tally is 90,345 votes for McSally and 88,267 votes for Barber. No word yet from Giffords. Barber's camp released a statement that they are waiting for the early ballots to be counted and won't concede until then. There is no time stamp on their statement so I don't know if it was before or after McSally took a 2,000 vote lead. UPDATE II: Even with more early and provisional ballots having been counted, Martha McSally still maintains a slight lead over Rep. Ron Barber (D-AZ). It now stands at a 363 vote lead with McSally having won 98,918 votes and Barber 98,555. This reminds me in a way of when Al Franken first won over Norm Coleman in Minnesota. It was not declared over until enough votes had been found to put the Democrat in the lead. The Tucson Daily Star reports that Barber has sent out a fundraising appeal for a recount. They report this is unusual because the state would pay for any recount. As it is, unless the margin drops to 200 votes, a recount is not ordered. UPDATE III: Martha McSally maintains a 341 vote lead going into Monday. There are still reported to be 9,000 provisional ballots left to be counted in Pima County. The McSally campaign has threatened a lawsuit to stop the counting of those ballots that don't have the required signature from an election official. Barber's campaign officials are calling this an effort "to disenfranchise" voters. I guess what the Barber folks really object to is having their ballot box stuffing called out. I just hope that McSally isn't "Al Franken'ed" by Arizona election officials. The good news is that Arizona Secretary of State Ken Bennett is a Republican. On this, the 239th birthday of the United States Marine Corps, I'd like to offer my thanks to all Marines, present or past, for their service. Semper Fi! The Commandant's Birthday Message is here. And below is the video birthday message. It centers around the battles for Pelilau and Fallujah. Denver-based Kroenke Sports and Entertainment is the parent company of the Outdoor Channel. It will now also be the parent company of the Sportsman Channel. They announced on Friday that they have purchased InterMedia Outdoor Holdings, Inc. from the private equity group InterMedia Partners VII, LP. In addition to the Sportsman Channel, they received 15 magazines, 17 websites, and TV production facilities. "The addition of InterMedia's outdoor assets to KSE is a natural fit and gives us the most diverse portfolio of media offerings in the outdoor lifestyle space. We look forward to providing our employees and talent with expanded opportunities to collaborate and take advantage of our resources. We are also excited about providing our business partners, advertisers and distributors with an unprecedented platform reaching millions of hunters, anglers and outdoor adventure seekers. We will spend the coming months laying the groundwork to fully maximize the reach and effectiveness of our newly acquired portfolio." Kroenke has picked up some venerable shooting publications in Guns & Ammo and Shotgun News. Moreover, Fly Fisherman was the first magazine to specialize in fly fishing. I still have some of the very first issues. Likewise, Gun Dog was the first in its category. I hope this acquisition works out well for all involved. The flowchart below is based upon the text of the Washington State initiative, I-594, that was passed by Washington voters on Tuesday. I did not create this flowchart. That said, it is a good illustration of all the trapdoors built into I-594 by Bloomberg's minions. We won more than we lost yesterday and for that I'm thankful. The US Senate will return to Republican hands. As it stands now, they have a seven seat pickup with two more probable wins in Louisiana and Alaska. Virginia is still amazingly close with about a 12,000 vote margin as of dawn. I'd say the Supreme Court is protected so long as the Lindsey Grahams and John McCains don't go all wobbly on us. I'm very happy to say that North Carolina went for Tillis. While he is an establishment Republican and wasn't the most exciting candidate, we did get a lot of good pro-gun reforms passed while he was Speaker of the NC House. It looks like Gov. John Hickenlooper (D-CO) will pull through barely as will Gov. Dannel Malloy (C-CT). Both look to win within the margin of fraud. Given that Colorado has mail-in voting, I wouldn't be surprised to find a number of votes for Hickenlooper coming from those ineligible to vote such as aliens and felons. Billionaires proved that you can buy elections in Washington State. The I-594 initiative won 59.7% of the vote. Looking at maps of the vote last night, it appeared to be Puget Sound versus the rest of the state (Spokane excepted). The best thing you can say about this win is that it was an initiative and not a constitutional amendment. As Miko Tempski explained to me, an initiative can't be altered by the Washington State legislature for two years and then all bets are off. So, for the next two years, don't loan or hand your firearm to anyone if you live in Washington State. More later as work does call and I haven't had enough coffee. Will Gecko Lures Be Banned At Geico Bassmaster Classic? I read a press release this morning on The Outdoor Wire that said GEICO Insurance was going to be the title sponsor of the Bassmaster Classic. 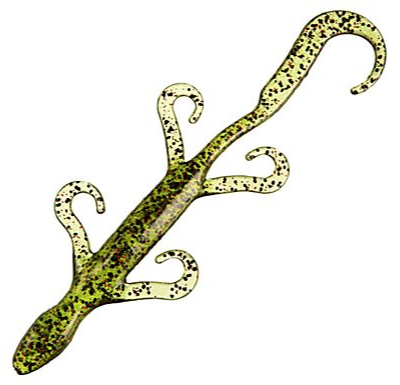 Bass anglers use a number of interesting lures including soft plastic lizards and geckos. That raises the question - given that the gecko is the advertising symbol of GEICO Insurance, will it be a banned lure at the GEICO Bassmaster Classic? After all, they have banned other lures in the past. And in the running for the most inane political ad of the year is this one from the American Future Fund. It popped up on me as I was playing one of those silly (but oh so addictive) Facebook games. Supposedly these ads are paid for by "the evil Koch Brothers". According to NPR - hardly an unbiased source - they funded these ads to siphon off votes from Sen. Kay Hagan (D-NC) in her race with Speaker Thom Tillis (R-Mecklenburg). Given how Hagan constantly appealed to low information voters and made the US Senate race seem more like a school board election, I'd say it is just desserts. Remember hipsters, "Get High, Get Haugh" has a better vibe than "Get High, Get Hagan". Many things the Republicans do don't thrill me. However, both Heller and McDonald were 5-4 votes. Justices Scalia and Kennedy are both 78 years old. The only justice that is older is Justice Ginsberg at 81. All three could live years more or all three could die in the next two years giving President Obama up to three appointments to the Supreme Court. A Republican majority in the US Senate is the only fire wall we have to prevent three anti-gun justices. Almost as important are the appointments to the District and Appeals Court level. These are lifetime appointments and we have seen how many of these judges have struggled to find any justification they can to deny Second Amendment rights. The National Shooting Sports Foundation and their #Gunvote campaign have got it right in the video below. The Senate is the key. Washington Alliance for Gun Responsibility is the pro-gun control group funded by billionaires that is pushing I-594 in Washington State. This initiative, if passed, would mandate background checks for all sales and transfers. One of their ads claims that you can buy guns at gun shows and off the Internet with "no questions asked". The ad shows someone typing in the URL for Gunbroker.com. I have purchased a couple of firearms off of Gunbroker.com myself over the years. They were either shipped to my local dealer where I had to fill out a Form 4473 and be checked or they were shipped to me directly because it was a firearm considered a curio or relic. I have a C&R FFL. Steve Urvan, CEO of Gunbroker.com, took exception to this ad impugning the reputation of his company. In the release below, he points out the reality. Recently a Washington state gun control lobbying group called The Washington Alliance for Gun Responsibility published an advertisement and YouTube video that included a scene in which GunBroker.com was typed into a browser. The video includes the words "NO QUESTIONS ASKED" and states that criminals who fail background checks can go online and buy guns. This ad is both misleading the public and impugning the reputation of GunBroker.com by depicting our company's name being typed into a search engine with the direct suggestion that we would enable an illegal transfer of a firearm. This is false and certainly libelous. "Firearms may only be shipped to a licensed dealer (FFL Holder)". Early voting ended Saturday in North Carolina. Despite having fewer days allocated to early voting, 17.4% of all registered voters have already voted. This is an increase 1.9% over the 2010 midterm election. More importantly, over 100,000 more registered Democrats have voted early than did in 2010. This is attributed to get out the efforts of the Democrats. While both sides increased their turnout and both sides are touting it as a good sign for their candidates, gun rights supporters who haven't voted need to get to the polls on Tuesday. I don't think I need to reiterate what is at stake. As a help for when you go to the polls, I'm publishing Grass Roots North Carolina's recommendations for the US Senate and House and the North Carolina Senate and House. While I can't speak for other areas of the state, NC Representatives Ramsey, Moffitt, and Presnell have been extensively targeted by out-of-state money flowing into PACs. All three are good on guns and all have been recommended by GRNC. Rep. Michele Presnell (R-Haywood-Madison-Yancey) went so far as to ask my friend Tim who owns a local surplus store what she could do to help gun owners. He suggested uniform signage for stores like the Texas 30.06 requirement and she was quite interested in it.